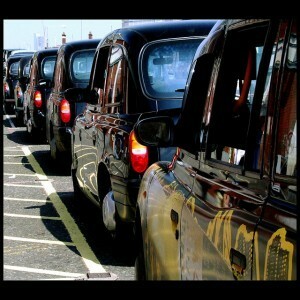 Black cab fares could go up by 15-20% during the Olympics, if TfL agrees to a proposal by the Licensed Taxi Drivers Association. "Our basic proposal is that we bring the evening tariff forward to the daytime, so about a 15% uplift... If we get 40% of cabs off the road, I'm afraid the average passenger won't get a cab at any price. They won't be there." Tube workers have agreed a pay deal for working during the Olympics so the cabbies feel their request is not unreasonable, given the possibility of sitting forever in traffic with no passengers (though of course the flipside is sitting forever in traffic with passengers) and the general expectation of chaos on the roads. The Evening Standard still reckons they're holding TfL to "ransom" - though their article makes the point that minicabs can charge whatever they like, whereas black cabs are limited to set tariffs. TfL has until February to make a decision. Every Olympics has its scare-story in the build up - Athens: will the stadia be ready on time? Beijing: will the pollution affect the athletes? - and it looks like traffic and transport is going to be ours.